The purpose of life — referred to in French as “raison d’etre” and in Japanese as “ikigai” — is undoubtedly the most imposing of subjects. People the world over, of every generation, are often searching to discover their life’s purpose, and it’s not an easy task. Discovering your life purpose should be, by its nature, an empowering, uplifting and positive pursuit of learning the truth about one’s own self. Three sources of wisdom will help: From Japan, the concept of ikigai; some lessons from late American entrepreneur Steve Jobs, who co-founded Apple Inc.; and insights from Bronnie Ware, an Australian nurse who spent several years working in palliative care. One of the most valuable methods to discover purpose, specifically career purpose, is the concept of ikigai, as originally detailed by Japanese psychiatrist author Kobayashi Tsukasa in his 1990 article “Ikigai”, and more recently by Spanish authors Hector Garcia and Francesc Miralles in their book “Ikigai: The Japanese Secret to a Long and Happy Life.” Ikigai is an introspective process, looking for a deep search of self so as to discover purpose. A widely-shared Venn diagram depicts ikigai as a valuable tool for discovering purpose, but mainly for one’s career. 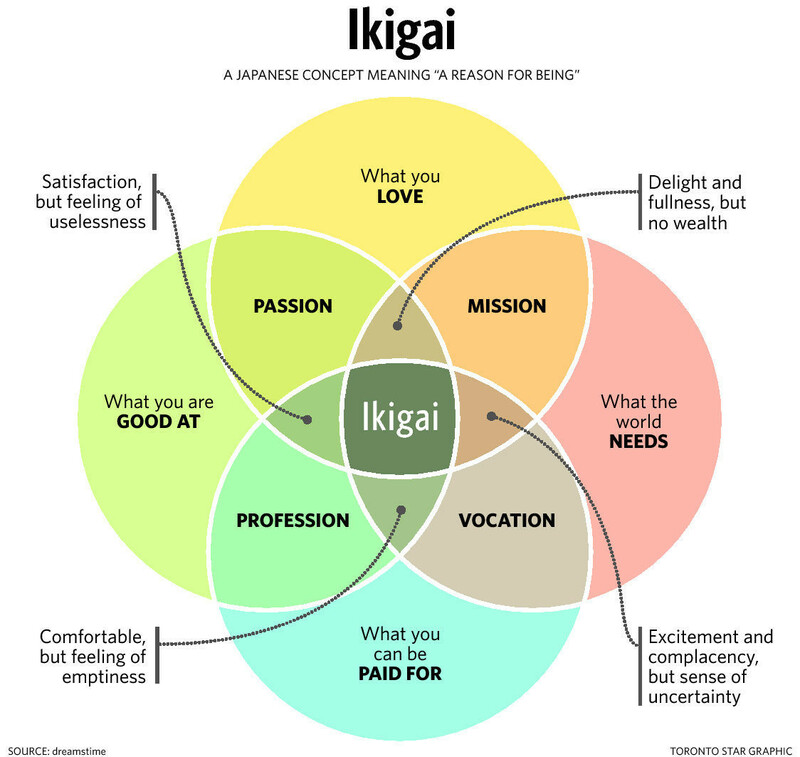 The four circles in this diagram are “What you can be paid for,” “What you are good at,” “What you love” and “What the world needs,” which, when overlapping, can help to generate profession, passion, vocation and mission, and which holistically lead to ikigai. Jobs died from pancreatic cancer on Oct. 5, 2011, but before his death he had made Apple a global business giant and changed the lifestyles of billions of people. Six years prior to his death, Jobs gave the commencement address at Stanford University, where he related three stories: Connecting the dots; about love and loss; and about death. It was not the stories he told which had the most impact, but the life lessons he imparted, which have universal appeal and for which his own words suffice. Finding your raison d’etre requires you to first reflect on the end of your life, what and whom you will leave behind and how you will be remembered — you must envisage your legacy and then spend a lifetime living it. Therefore, discovering one’s life purpose requires you to first reflect on the end of your life. When you go, what will you leave behind? Whom will you leave behind? How will you be remembered? This is design thinking, whereby you envisage your legacy and then spend a lifetime living it. • Talal Malik is chairman and CEO of Alpha1Corp International, a trusted adviser to some of the world’s top government and business leaders, and a dedicated humanitarian.